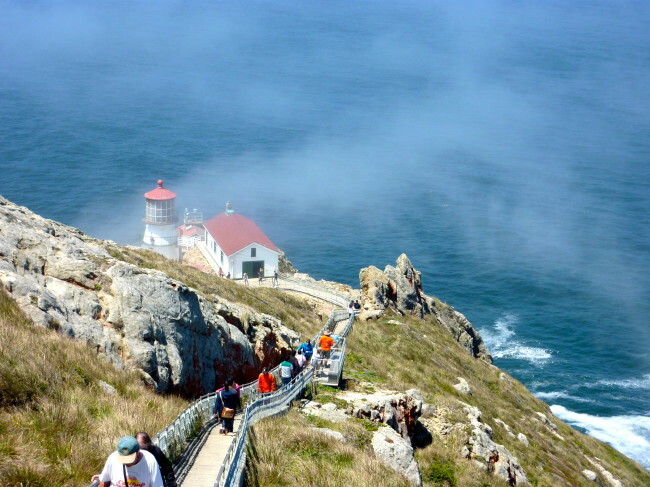 The odds of a sunny day at Point Reyes Lighthouse along with me climbing up and down 616 stairs without having to use a defibrillator are just about nil. Yet, on the 4th of July, those two amazing events occurred, and I lived to tell about it. 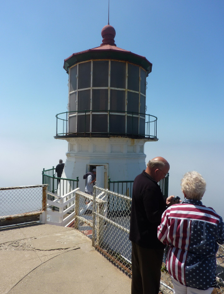 Our friend, Kim, kept telling me that, although it was a warm and sunny day on the Sonoma Coast, it would probably be foggy at the lighthouse (like this photo above that I took off some website), so be sure to pack some extra layers of clothing. 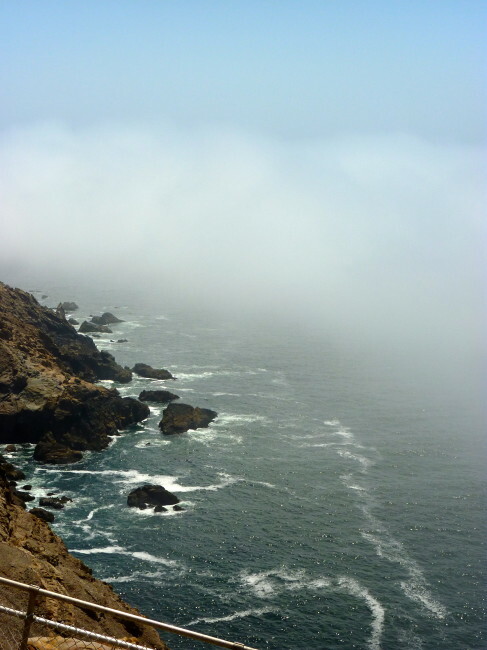 That’s because, according to the National Park Service website, “Point Reyes is the windiest place on the Pacific Coast and the second foggiest place on the North American continent.” On the morning of July 4th, Tracy and I, along with friends Kim, Mary and Dan piled into Kim’s car and made the trek to Point Reyes (located on the rugged California coast north of San Francisco) from Bodega Bay. 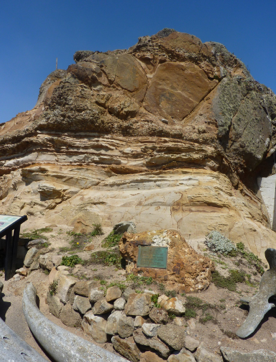 Sebastian Vizcaino coined the name Point Reyes. 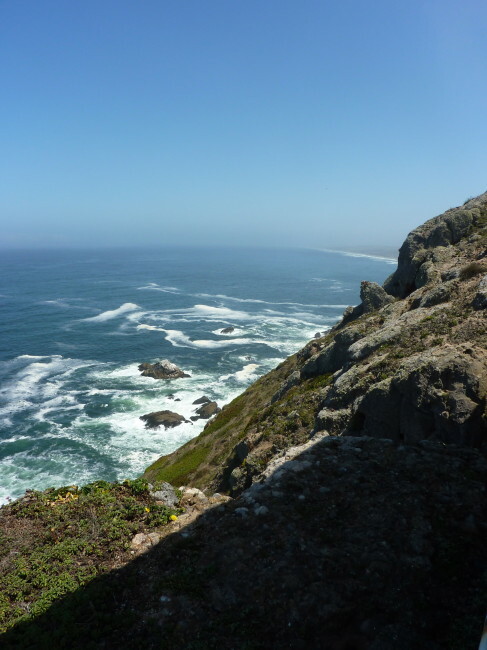 He sailed along the California coast in 1603 and on January 6, which happened to be the 12th day of Christmas, Vizcaino passed the peninsula and instead of calling it 12 Drummers Drumming named it “Punto de Los Reyes,” for the Feast of Three Kings. It took nearly 90 minutes along two-lane roads to finally reach Point Reyes and a nearly deserted parking area (more on that later) a bit before 11 a.m. Then we saw the distressing sign saying that the lighthouse was closed on Tuesday, Wednesday, and Thursday (this was a Thursday). On the bright side, the sun was winning against the fog. 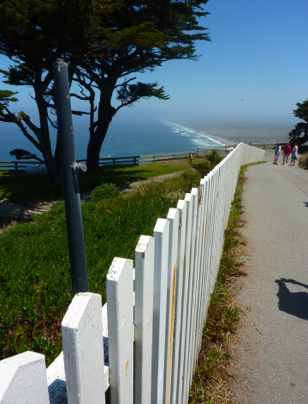 However, the 0.4-mile trail to the lighthouse was open, so we thought they might open it up for a holiday, so off we walked. 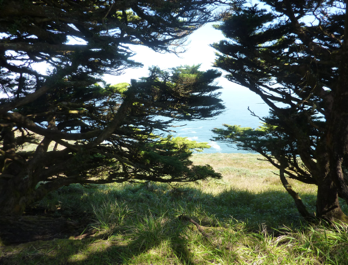 It was mostly uphill to the ranger station, but the views along the way made it a nice hike. 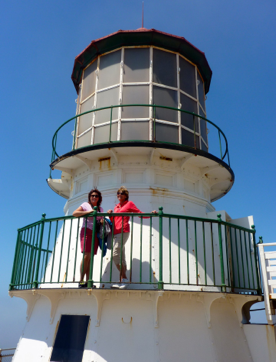 When we got to the ranger’s office, we were pleasantly surprised to find out that the lighthouse was, indeed, open. 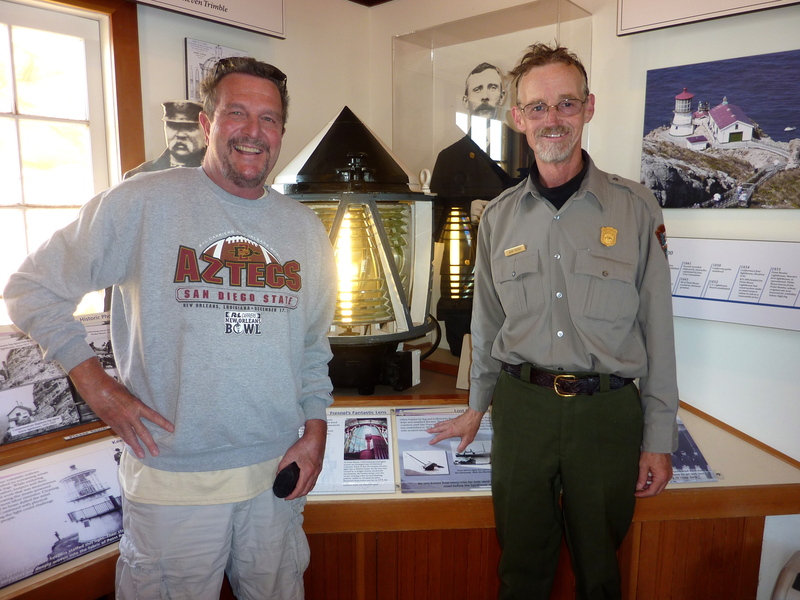 Ranger John was happy to explain to us about the origin of the lighthouse’s Fresnel Lens, a lens with a technology that dates back to the 1820s and whose design is credited to Augustin Jean Fresnel of France. 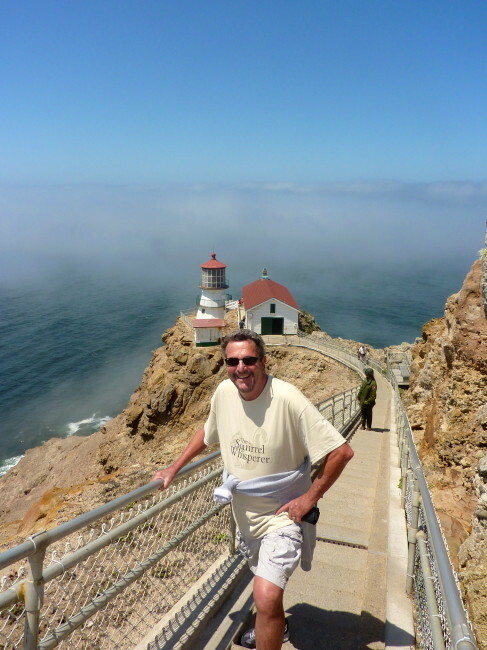 The Point Reyes Lighthouse lens was built in 1867, and John (after posing for a quick photo in front of the lens) offered us, and a few other tourists, a good introduction to our day before we descended the 308 steps to the lighthouse. Our break was now over. We started the long hike to the bottom. The looks on the faces of those climbing to the top did not seem as happy as we were. 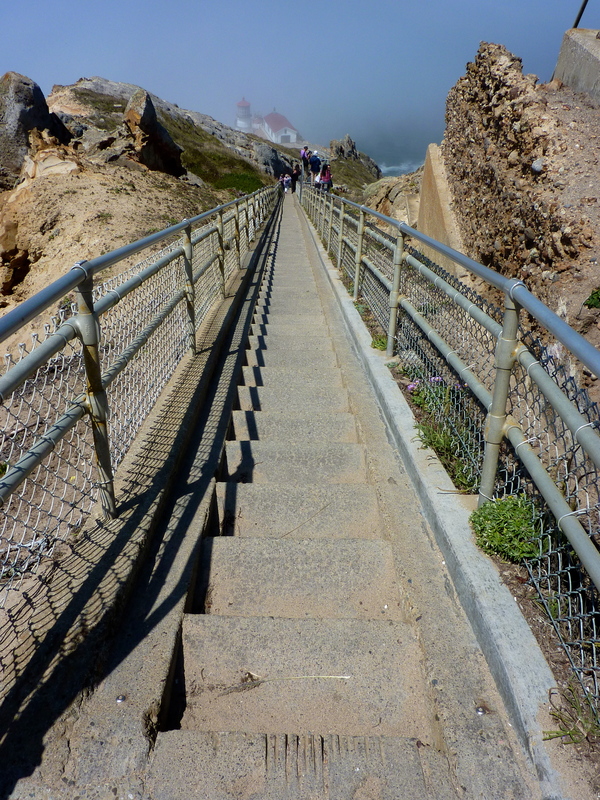 It was a long way down…meaning it would be a long way back up. 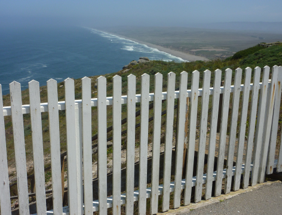 Again, the views were spectacular. 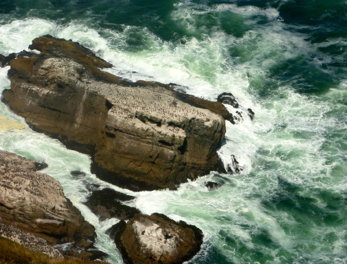 Finally, the lighthouse was within striking distance. 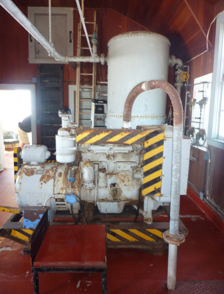 Before getting to the lighthouse, there is a little area that contains some of the motors used at the lighthouse, plus it also had writings by various lighthouse keepers, some who went literally crazy because of the loneliness of working in such a desolate area. Not only were we fortunate that the steps to the lighthouse were open today, but then we got even luckier. Another ranger (a very pretty ranger I might add) took us inside (usually, the lighthouse is only open in the afternoon starting at 2:30) to get a closer look at a replica of the Fresnel Lens. Once we exited, she closed the doors, and we were the last to visit until it reopened later in the day. 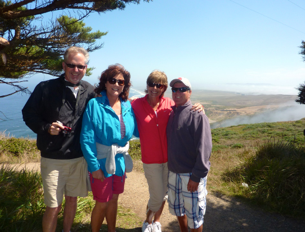 We did a little more exploring, taking in the beautiful vistas. 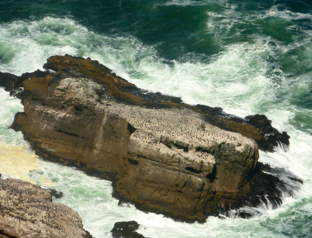 We were told by the ranger that there are hardly any days during the summer where the weather cooperates like it was on this particular day. 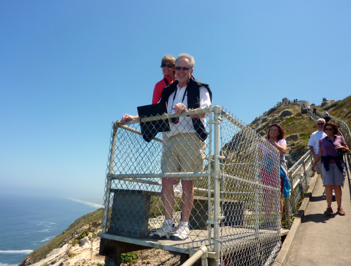 After snapping a photo of Mary and Tracy at the lighthouse, I then saw the bottom stair that brought me back to a harsh reality. 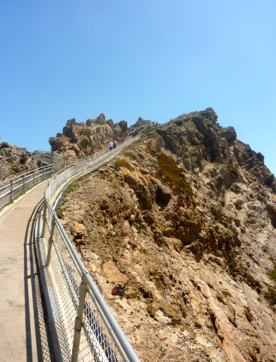 We now had to climb the 308 stairs back to the top. Where’s that damned escalator when you need it??!! 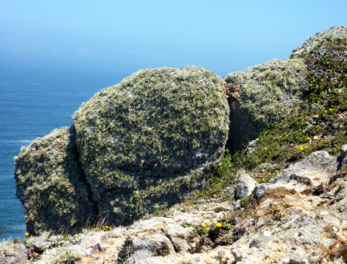 Along the way, we would pause not only for the views but for the interesting rock formations and whatever was growing on them. 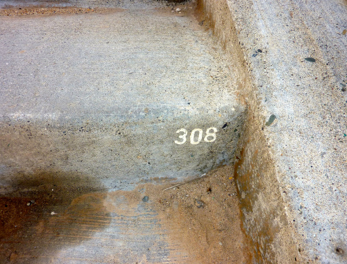 There were a few places alongside the stairs where we could stop and rest (if we made it there). Some (like me) just rested on the stairs. Looking back at the lighthouse, there were wisps of fog in the sunlight that made the entire scene even that more gorgeous (plus it gave me another excuse to stop and catch my wind). Eureka, we finally made it to the top!! By now, we were all very hot, so our layers were long gone. 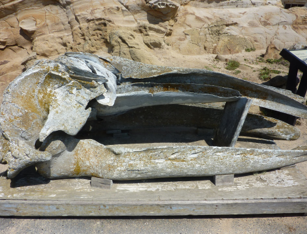 We checked out the whale bones next to the ranger’s office, and it was off on the nearly half a mile walk back to the car. There was just a hint of fog and mist, and the coast was gorgeous. 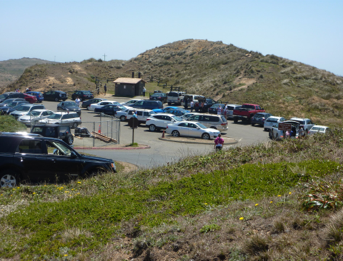 The lot (nearly empty when we arrived) was now full, and cars were parking all the way down the road. 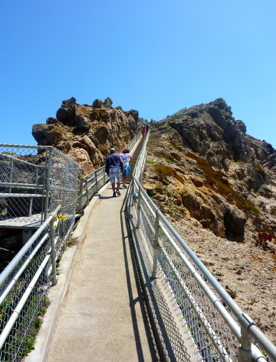 The suggestion would be to get here early, and unlike some of the people who we witnessed navigating the stairs in flip-flops and other insane shoe choices, wear appropriate footwear, or you might tumble down a few hundred stairs and have to be hauled out by a pulley (no kidding). 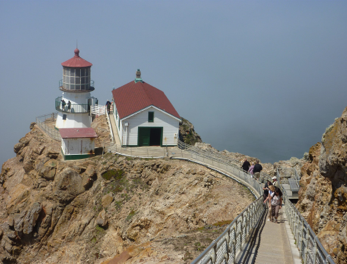 Built in 1870, the Point Reyes Lighthouse was retired by the U.S. Coast Guard in 1975 after an automated light was installed. 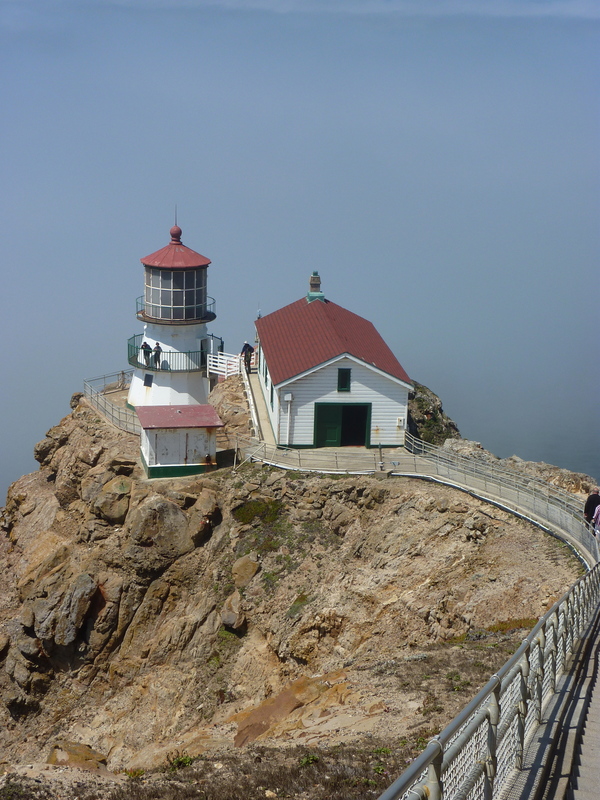 Point Reyes Lighthouse is a great place to visit. 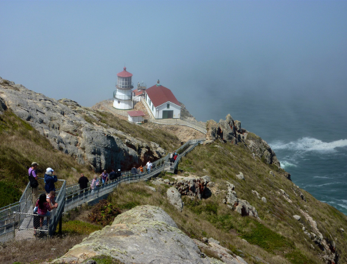 The odds of you getting a sunny day as we experienced is very rare, but whether the weather is sunny or foggy, the Point Reyes Lighthouse is a cool (and sometimes warm) place to spend a couple of hours. 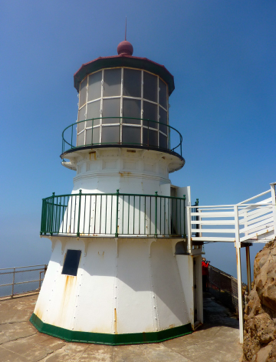 Lighthouse Hours: Friday – Monday 10:00 a.m. – 4:30 p.m. 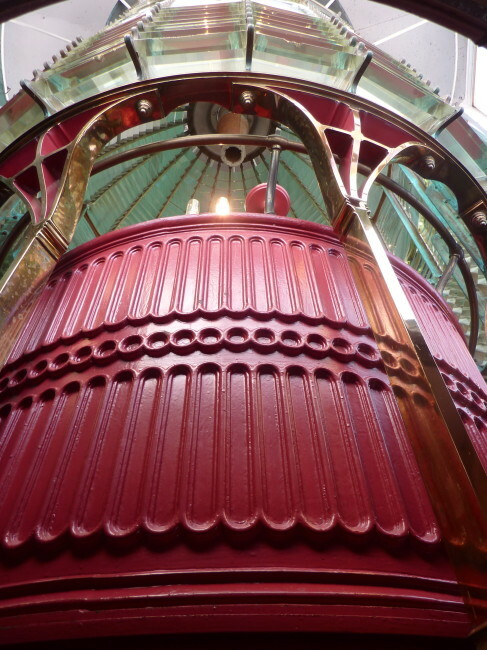 The stairs leading down to the Lighthouse, the exhibits in the lower Lighthouse chamber, and the Equipment Building is open (weather permitting): Fridays through Mondays from 10 a.m. to 4:30 p.m.
Fridays through Mondays from 2:30 p.m. to 4 p.m. Directions (courtesy of the National Park Service): From San Francisco, take 101 North to Marin County. Exit at Sir Francis Drake Blvd. 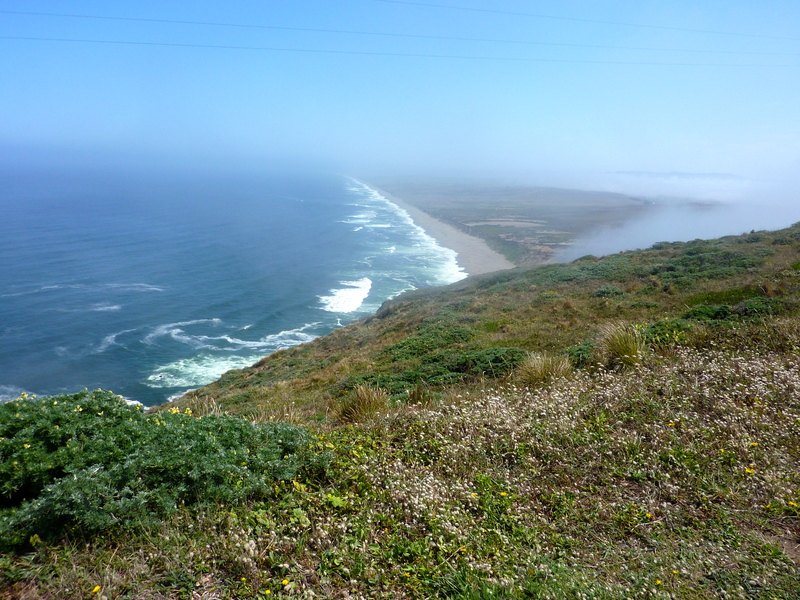 Continue west through Olema and Inverness to the Point Reyes National Seashore. You will pass numerous cattle ranches along the way. 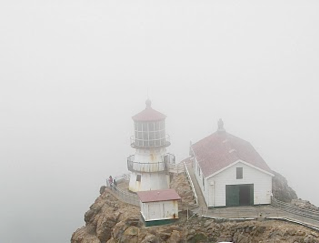 Drive with care – the route can become quite foggy. 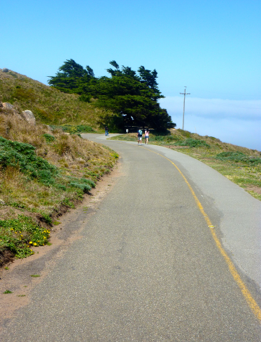 Continue all the way to the end of Sir Francis Drake. 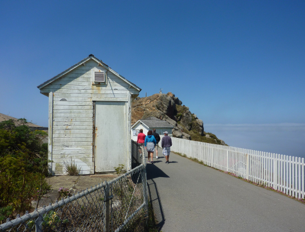 The Lighthouse Visitor’s Center is 0.4 miles from the parking lot. The light itself is down another 308 steps. Dress warmly – the headlands can be quite cold even when the inland is warm and sunny. 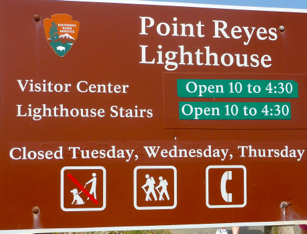 You may wish to call in advance, as the lighthouse is sometimes closed due to high winds.